We have received some constructive criticism recently regarding a discrepancy between our reviews of certain wings and their corresponding rating. For example, a buddy of ours texted us and said “I noticed you said those wings were decent, but you only rated it like a 6!” This is a valid concern, as we strive for consistency above all else. We hope to clear up any confusion by sharing our grading scale and category review breakdown. Much like Dave Portnoy’s world famous “One Bite” pizza reviews, our scale maxes out at a 9.9 because we at Shark Bite do not believe a 10 wing exists. Like in the world of Olympic gymnastics or professional ice skating, you have to only give extremely high ratings in rare instances. If we eat a 10 wing at a restaurant and then somehow we have better wings 2 days later, what are we to do? Our hands would be tied and validity as food critics ruined. Given that thought process, our sweet spot is somewhere between 6.5 and 7.5. The lower end of that sweet spot is just an overall good wing, but not a wing spot you would recommend if your buddy was coming to town. The upper end of that scale represents wings that we would consider going back for after the reviews are over. ● Belly Feel: feel like you ate a brick? Bogged down? Heartburn imminent? With a name like Roosters, we knew we were going to get some high quality wings. The buffalo sauce here was tangy with a nice kick. The spice held its own as we ate these wings at a 1 wing to 1 sip ratio. The wings were well cooked and completely covered, drowning even, in buffalo sauce. When we finished eating there was an inch deep puddle of buffalo sauce in the bottom of the basket. We recommend either eating these wings shirtless (the way God intended) or bringing a family pack of Tide-to-Go pens with you. Despite having to use a snorkel and goggles to avoid getting lost in the sauce, the wings maintained a great crunch. They were fried to a crisp on the outside, but still juicy and tender on the inside. It’s uncommon to find a wing that is both drenched in sauce and still crispy, so Roosters really defied the laws of wing physics on this one. While we were sitting there letting the crunch of these wings take us for a journey, this guy recognized us and demanded a review on the spot. After disappointing our #1 fan by not performing for him on command, he shouted at the bartender, “Give me $5 worth of wings!” The bartender, clearly loving his job, said, “Man, I don’t know what that math is, I can only do 6 wings for $3, or 12 wings for $6.” The big takeaway here is restaurants, unlike pawn shops and traveling flea markets, don’t appreciate people slapping money on the table and yelling, “What’ll that get me??”. These wings were deceptively small. They looked tiny, but they actually had a good amount of meat on them. However, the baby wings were wasted on what tasted like straight-from-Walmart ranch. They at least took the time to pour the ranch out of the Hidden Valley bottle and into a plastic cup, but the ranch was a big let down. The wings didn’t come with a side, so we ordered the fry basket. The fries were done surprisingly well and were generously seasoned. We at Shark Bite are not fry experts, but these fries had some pretty spectacular qualities. Normally at a bar you get a drunk wing that tastes great while intoxicated but would leave your sober belly running for the toilet. However, these wings were pretty light on the stomach. When we finished eating Rooster’s wings one of your writers went on a date. Within an hour of eating 6 wings, he ate an entire pizza and still managed to make it to class the next day. While these wings weren’t bad by any means, but we didn’t call our parents crying with joy. But if you’re in the mood for classic bar wings at a good price, Rooster’s is the move. Gus’s wings were like stepping up to bat and being thrown a basketball. You’re gonna be caught off guard, but you’re still gonna take a swing at it. These were full size wings- flat & drum still connected boomerang style. 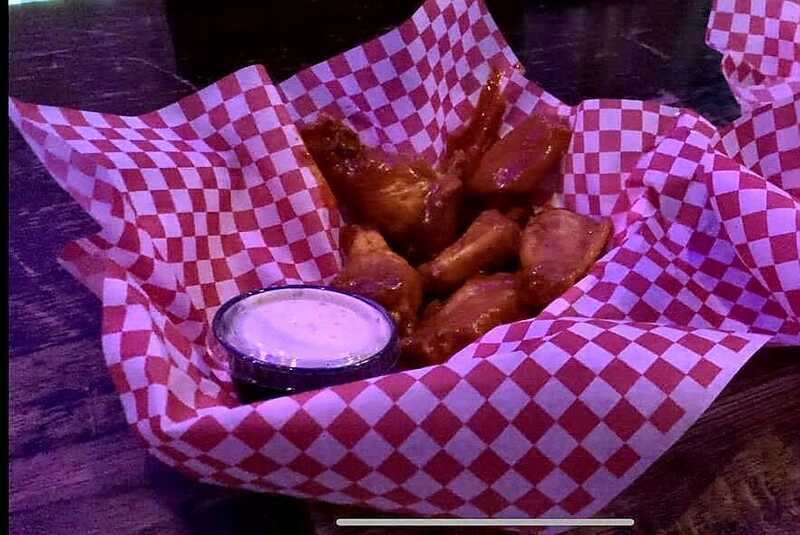 Putting sauce on full size wings like these just makes a mess, but still we are looking specifically for the best Buffalo wing in Oxford. Exceptions may be made in cases such as Jinsei, where they substituted buffalo sauce with their house teriyaki glaze, at least giving us a substance to review. This differs from the case at hand where the wings were served with no sauce at all, forcing us to give it the lowest possible score out of necessity. Although there was a lack of Buffalo sauce, the waitress said that the wing batter is different from the normally fried chicken batter, and that gives the wings their spice. Normally bigger wings are significantly lower quality. This was not the case at Gus’s. These wings were gigantic and the meat literally fell off the bone. When you have a fully connected wing, you usually have to forcefully tear the bones apart so you can eat them. These wings, however, were extremely cooperative and virtually separated the moment we touched them. The chicken was cooked thoroughly, and also was crunchy on the outside while also tender and juicy on the inside. They advertise never frozen meat, and you could absolutely taste that fact. Putting this chicken up against the freezer-burned wings we’ve eaten so far in our search of the best wings in Oxford is just unfair. Going into each restaurant every week, we know the categories we have to rate. At Gus’s, we felt strange ordering ranch. When we asked for ranch the waitress looked at us like we were eating soup with a fork- she even forgot to bring it out and we had to ask again. Despite the odd looks for wait staff, the ranch held up. It wasn’t the best ranch we’ve ever eaten, but if you’re a big fan of dipping your food into ranch it will get the job done. We wouldn’t hesitate to recommend Gus’s if someone was just looking for great chicken. If we found ourselves in there in the future, we would probably order wings again. They weren’t Buffalo wings, but they were unique and tasty enough to fill our bellies again. The most unique part of this experience was that it was a full meal. 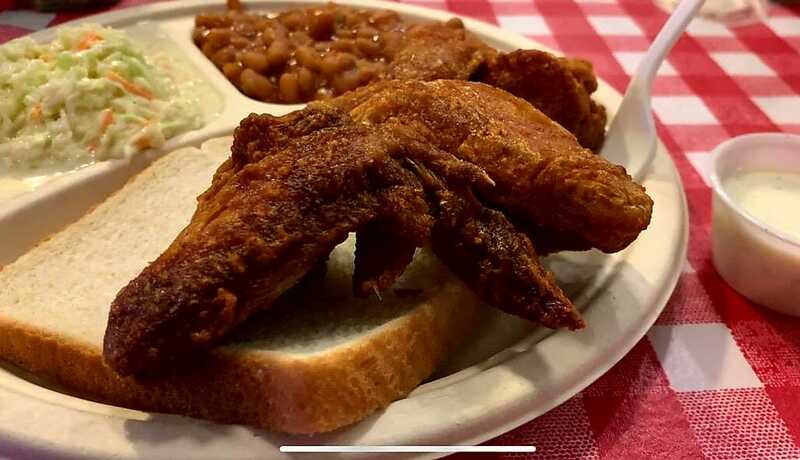 Served with coleslaw, baked beans, and white bread, Gus’s wing meal was a welcome change. This was a true main course wing experience.